Friends at Home * Sign up and join the fun! 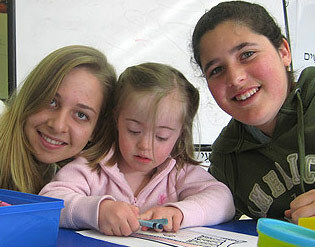 The Friendship Circle extends a helping hand to families who have children with special needs, involving them in a full range of social and Judaic experiences. The Circle's unique formula introduces teenage volunteers to the children and their families, and through the shared experiences, all are enriched. The child with special needs looks forward to a weekly visit and the opportunity to play with and learn from their older friends. The teenage volunteer learns the value of giving, and cherishes the experience of making a difference in a child's life and bringing a smile to his or her face. The child's family gets a needed respite and the pleasure of seeing their child become a part of the community circle. Thank you for completing this form. One of our team members will contact you shortly.